As dusk fell over Staten Island on a recent evening, about 10 people sat around a large wooden table in a communal kitchen, listening to Van Morrison and painting terra-cotta flowerpots. Houseplants were suspended from the room’s high wood-beamed ceilings, and the smell of freshly baked bread hung in the air. A hippie house share? Not quite. It was crafts and cocktails night at Urby Staten Island, an upscale rental complex where the demographic skews more young professional than drum-circle enthusiast. 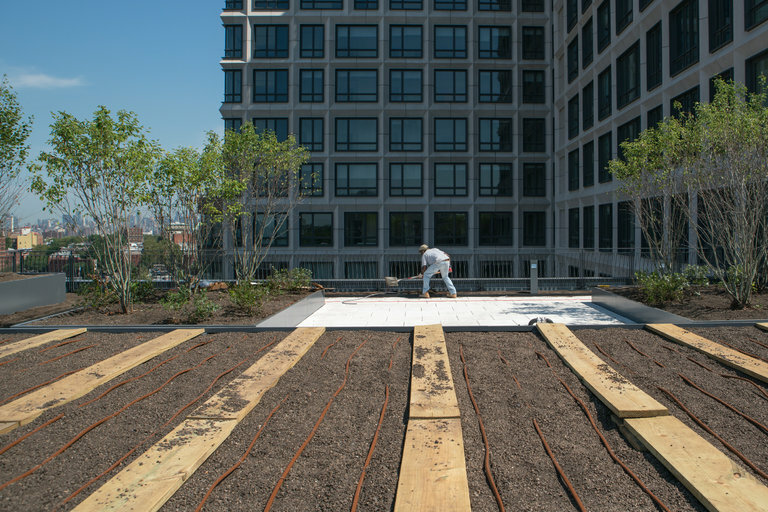 Nonetheless, the complex has features that might make that crowd feel right at home: In addition to the communal kitchen, there’s a 5,000-square-foot urban farm, a 20-hive apiary — both tended by live-in farmers/beekeepers — and a kombucha workshop planned for later this summer. “Live cultures are really something people are responding to,” said Brendan Costello, the complex’s in-residence chef, as he wiped the last of the bread crumbs and black maple butter from the countertops. He has already taught well-attended workshops on making sauerkraut and kimchi. Just as Birkenstocks and bee pollen have come back in style, so have crunchy lifestyle concepts, from yoga and meditation to composting and home fermentation. And with veganism, Waldorf schools, doulas and healing crystals shifting from far out to very much in fashion, a growing number of New York luxury buildings have embraced the hallmarks of 1970s hippiedom with a high-end twist. Look for amenities like rooftop gardens, kitchen composters, art and meditation studios, bike shares, infrared saunas, even an adult treehouse. “Especially in Brooklyn, the concrete jungle is not the atmosphere people are aiming for,” said Ashley Cotton, an executive vice president of Forest City New York, whose recently opened condo in Prospect Heights, 550 Vanderbilt, developed in partnership with Greenland USA, has window planters for units on lower floors and a communal garden terrace with individual plots on the eighth floor. Two of the terrace’s six large planters will be tended by a nearby farm-to-table restaurant, Olmsted, which will also offer gardening lessons to residents. At Pierhouse, the Toll Brothers City Living condo in Brooklyn Bridge Park in Brooklyn, every kitchen has an in-unit composter, a first for a Toll Brothers development. While such amenities might be aspirational for some, others are yearning to get their hands dirty. Christine Blackburn, an associate broker at Compass real estate, said that for a woman to whom she recently sold a condo at 144 North Eighth Street in Williamsburg, Brooklyn, the roof garden was the most important amenity. “She didn’t care about the gym, she didn’t care about the garage,” Ms. Blackburn said. “They live in a $2 million condo, but for her to be able to grow tomatoes with her son, that was it. Public green space has always been a priority, of course, and let’s not forget that large swaths of all five boroughs were once farmland. Green rooftops have some historical antecedents in the city: The Ansonia, on the Upper West Side, kept 500 chickens on its rooftop farm in the early 20th century, with eggs delivered daily to the tenants, according to “The Sky’s the Limit,” a book by Steven Gaines. But the roof was shut down by the Department of Health after just a few years, in 1907. And for the past century, it was accepted that living in New York meant leaving nature, and local honey, behind. Indeed, the explosion of the wellness industry has left many craving a different kind of New York lifestyle. For a younger generation, practices like organic gardening and meditation may not carry any whiff of the counterculture. “Being green is modern, being organic is modern,” said Jordan Horowitz, 26, an assistant manager of Enterprise Rent-a-Car who grew up gardening in suburban New Jersey and was excited to get a studio at Urby, where residents have an entire city block of gardens. But he is equally enthusiastic about the pool, the giant bean bags strewn across the grounds and learning to make Vietnamese cuisine from scratch in Mr. Costello’s cooking classes. That many such offerings tend to be far more upscale than their 1970s counterparts no doubt helps to remove any lingering hippie vibe. Rather than a stable of rusty Schwinns, for example, 50 West, in the financial district, allows residents to pedal out on Porsche bikes that cost $3,700 a pop. “Yes, it’s sharing, but in a luxury manner,” said Javier Lattanzio, the sales manager at the condo. The adult treehouse at One Manhattan Square on the Lower East Side, likewise, is hardly primitive, with Wi-Fi and a staircase. As for all those rooftop herb gardens, asked if they are actually used, one broker replied that they definitely were, though not necessarily for a Moosewood recipe: On a recent trip to 338 Berry in Williamsburg, she saw people with Aperol spritzes clipping herbs to put in their cocktails. At Hunter’s Point South, Related’s massive affordable housing complex in Long Island City, Queens, residents can receive deliveries of fresh vegetables from a C.S.A. — community-supported agriculture. There are also an apiary, about 2,300 square feet of rooftop gardens and a waiting list for the gardening club. “Everyone wants to garden now. I think New Yorkers have gotten comfortable with the amount of concrete we have, but they also want to see green,” said Joyce Artis, a retired Port Authority worker who helps organize the gardening program at the complex and grows microgreens and lemon trees in her apartment. She expects the enthusiasm to continue and intensify. “I wouldn’t be surprised in a year if a luxury building had a chicken coop,” she said.